Lock in a great price for Golden Lakes Rooms – rated 9 by recent guests! Excellent menu. Super friendly staff. LOCATION to the lakes. The price was exceptional as well. Wonderful facilities for the price we paid. It was smaller for 2 queens, but like I said: great food, staff and price. Quiet at night. Medium firm bed. Not too hard or soft, but was a bit bouncy to me because I'm accustomed to memory foam at home. CASH ONLY..Seriously, stay here. The location is not far from Plivitce park (near entrance 2). The staff is helpful and recommended us about how to go to the lake. The breakfast is good, you can order scrambled, sausages and bacon. The room is clean. The room was clean and comfortable; small though. The cook made some excellent food which was a respite from the regular, blande and boring food. 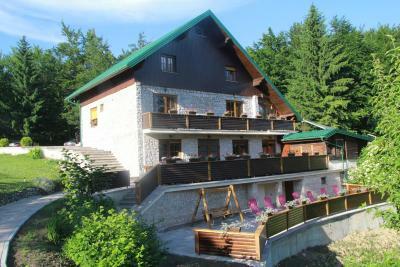 The manager was well informed and gave us good suggestions of the routes to be taken in Plitvice lakes. What a wonderful place. Most of all it was Lily who made our stay perfect. She works so hard. Her dinner was the best meal we had in croatia. Also the breakfasts are excellent. She went out her way to makes us happy. I hope we were a bother to you. Very clean, modern, perfect location close to the lakes. This was a great property to stay based upon the location. Lily, our host was very friendly and helpful. The food selection was great for breakfast. I decided not to take the opportunity to eat dinner because, for me, there would have been too much food to eat and cost was too expensive. If I had the choice to eat only selected items for the dinner, I may have chosen to eat the dinner. Parking was easy and convenient. I would stay here again. Very close to Plitvice Lakes which was awesome. The staff was the best part of our stay, Lilly greeted us with a warm smile and made us feel at home. Golden Lakes Rooms This rating is a reflection of how the property compares to the industry standard when it comes to price, facilities and services available. It's based on a self-evaluation by the property. Use this rating to help choose your stay! 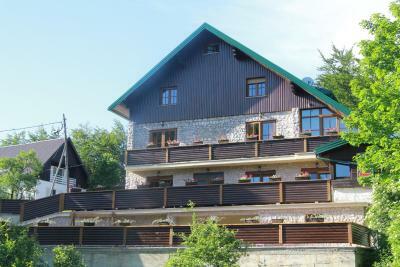 One of our top picks in Jezerce.Plitvice Golden Lakes Rooms is located 0.9 mi from the entrance to Plitvice Lakes. 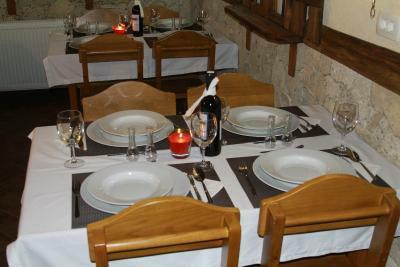 Set in a quiet area and isolated from the main road, the property features free WiFi and a flat-screen TV in all rooms. All rooms offer a desk and chair, a wardrobe and a private bathroom with a shower. The units overlook the surrounding pristine nature and some also feature a balcony. 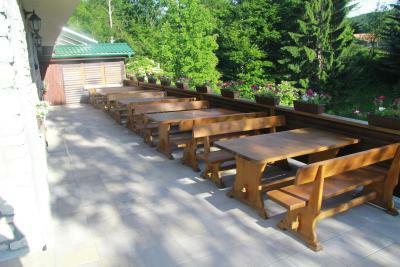 There is a shared furnished terrace and guests can park for free on site. A pizzeria restaurant is 1,000 feet away, while a grocery shop is 1,950 feet from the property. The local busses stop 650 feet away, while Zagreb International Airport can be reached in 87 mi. 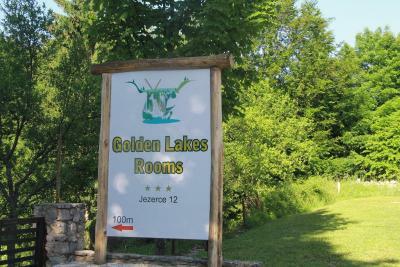 When would you like to stay at Golden Lakes Rooms? Room offering a desk and chair, a flat-screen TV and a private bathroom with a shower. House Rules Golden Lakes Rooms takes special requests – add in the next step! Friendly staff, great location only a few minutes drive to the national park. Food was great with big size portions. Good location and friendly staff..
TV in room had problem with the sound being distorted. Location, staff, evening meal and breakfast excellent, will certainly return. Room could use some black out curtains. Perhaps better heating. The guesthouse staff were friendly and helpful. We ate dinner there and the food was delicious! Friendly Staffs, Great Breakfast, Great Location. * Ask your GPS how to get there: If there was any signposting, it was certainly very well hidden! * The rooms are much smaller than they appear in the photos on booking.com! * You better like air freshener because there’s A LOT of it in the air! * Good luck with figuring out how to switch off the main light: if the combination of settings of the three (!!) switches connected to the main light is wrong, then you’ll get a nice show of rhythmically flashing lights! Takes a bit to figure out how to solve that puzzle! * Good luck also with finding the switch for the light above the mirror in the bathroom in less than 5 minutes. (hint: check behind the mirror!) Some sort of lampshade would have been nice, too! * The shower is modern and spacious, but the showerhead holder is loose, so you either hold it in your hand or you are content with the spray of water that reflects off the shower’s back wall. * Talking of taking a shower: no soap or shampoo is provided for the shower. And there’s also no ventilation system in the bathroom, which means it will be wet and steamy for a long time! * You can choose to run two of the following three appliances at the same time: fridge, heater or TV. If you want all three on at the same time, then you better bring an extension cord. * Thanks for the free WIFI - would have been great if it had actually been connected to the internet as well! * So you pay for it with your credit card online only to find out that you haven’t actually paid yet ... and that you need cash to do so because they don’t accept any credit cards. Would have been great to actually been told to expect that without having been given the impression that everything’s settled already upon booking and without having to wade through a booking confirmation document that (I bet) about 0.3% of guests actually read! Off the main roadway but close enough to entrance 2 of the park.Lily even showed me a short cut to the park through the woods which was handy.Dinner portions were very very big and eggs done to your liking were also served for breakfast in addition to cereals etc.Lily was a great host throughout and very helpful with everything.Well done Lily keep up the good work. We loved staying at Golden lake rooms. The location was perfect. The staff helped us with park advice. Our food was so delicious and the service was so friendly! night lamp above the bed too high above the bed. Debit/credit cards not accepted. Very good breakfast. Limited choice for dinner. Room was small, and the mattress was uncomfortable. There was no bin in the room, which was inconvenient and we had to throw our rubbish in the very small bin in the bathroom. No kettle and no fridge in the room. Shower cubicle did not serve its function well, and the bathroom was flooded every time we showered. There was a price list in the room (we assumed it's a valid price list else why kept in the room), which we found out that our booked price from booking.com was almost 30% higher compared to price list from the hotel during the off-peak season (we stayed in end of October). Payment must be paid in cash, be sure you have enough cash with you. Contrary to what other reviewers mentioned here, we did not find the receptionist friendly. One example, when asked about how's the weather tomorrow, we were told that we could check ourselves. Despite this comment, she helped us check the weather but our impression was "meh". 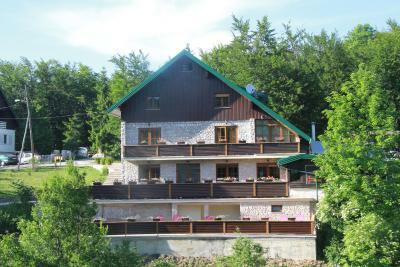 Good location, near to the lake. Clean room with a view. The room was cleaned daily, and the bedsheet was changed daily. Room price included breakfast. Limited breakfast choice but we could live with that, and dinner was reasonably good but for the price paid, you could get better food out there if you have a car. 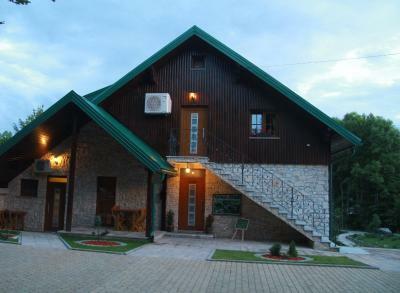 It's about 30 minutes walk on the main road from the hotel to Entrance 2 of the Plitvicka Lakes. The road does not have a footpath and so is not safe to walk on. There is a public footpath, but it takes about 40 mins to walk and goes through the forest which is not good in the dark and when the ground is wet. Having said that, if you are able to and like walking then it's not a problem (weather permitting). Public transport is not good, so it's best to hire a car. It's a nice little hotel away from the main road. It was peaceful and quiet at night for sleeping. Immaculate and clean inside, especially the bathroom. The breakfast and dinner was quite nice. If you don't have transport, then you can catch the bus (Flixbus) from Split, Zadar or Zegreb and stop off or catch the bus from the Mukinja Bus Station which a few minutes away from the Entrance 2 of the Plitvicka Lakes (This information is not available over there, no body knows, we have experienced it ourselves). The member of staff who attended to us (Lilly) was just wonderful, so helpful and full of energy.